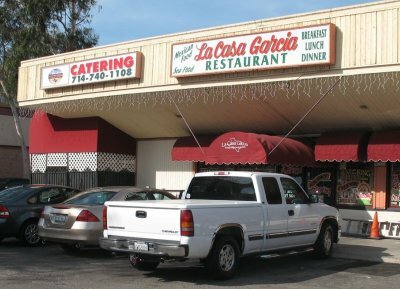 La Casa Garcia has been serving Mexican food in Anaheim since 1973. The Garcia family still runs the whole operation including the restaurant and a catering service. Frank Garcia came to California from Texas and offers up Texas-style "barrio" food. That included the menudo they still serve everyday. 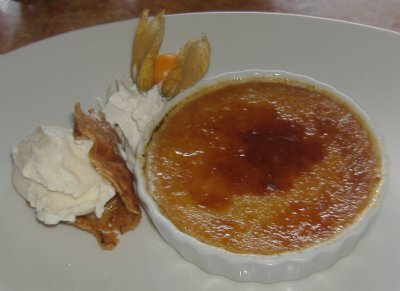 The menu is extensive and they are open every day breakfast, lunch and dinner. My wife Thea and I stopped in for lunch recently. They had been serving a lunch buffet but we found out they stopped doing that to put their efforts into some new projects. Fortunately they have a nice selection of lunch specials and a special board to boot. Their Texas roots show up here as BBQ ribs are added to the Mexican entries. 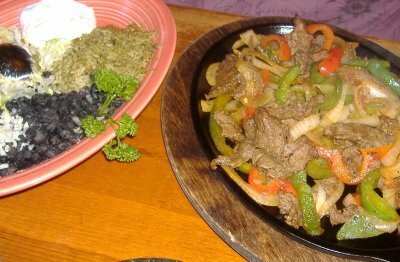 So here you have a real Tex-Mex place unlike the chains that have abused that title. You'll see from the interior photo that the walls are covered with donation envelopes for the yearly Thanksgiving dinner that Frank Garcia & his family have put on for the last twenty years for anyone who needs a meal. Check it out at http://www.wegivethanksfoundation.org. That alone should make you want to drop in spend your dining dollars here. 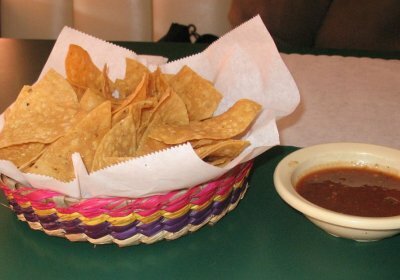 As is typical the meal started off with chips and salsa. Health nuts and vegetarians beware as we confirmed the chips ARE fried up in lard. You can taste the difference and they are great. Add to it a kickass thin spicy salsa and it is hard to get past the chip munching. 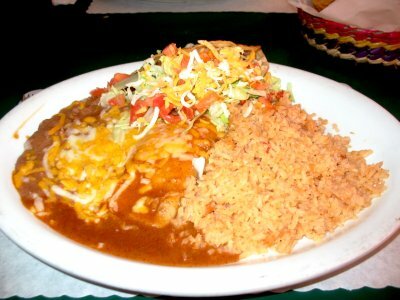 I ended up ordering the Enchilada de Pollo Rancheras con Queso, but I was tempted by a number of the seafood dishes they specialize in. The chicken was super moist and tender. Clearly it had been simmered for hours in a savory mixture. 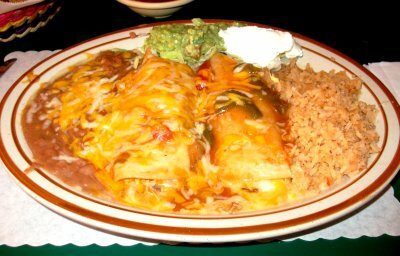 The enchiladas were topped with a ranchera sauce and lots of cheese. Guacamole and sour cream were served on the side. The usual rice and beans sides were included. The beans were quite good and the rice was a good foil for that spicy salsa. Thea went with the #1 combo which was a cheese enchilada and shredded beef taco. She found the enchilada sauce different than the usual ones but quite tasty - a little more tomatoey than a pure chili sauce. The hard shell taco with shredded beef was an old school classic. The sodas come in giant glasses. That will be helpful for those of you how eat too much of the spicy salsa. I feel we need to go back and try more of the menu. 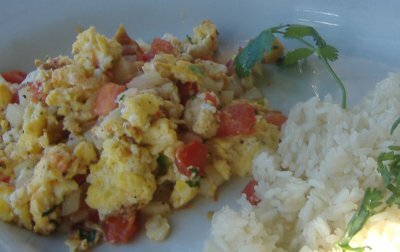 The classic items we ordered were very good, but a whole breakfast menu awaits us as well as some tempting seafood and caldo (soup/stew) choices. But clearly this is a classic old time Mexican diner with a loyal clientele. Hopefully with the new generations of the family involved it will last another 35 years. Got to try out the new Veggie Grill at the Irvine Spectrum (on the back side near the Barnes & Noble) yesterday before its grand opening to the public tomorrow, November 21st. This is their third location after the one in El Segundo and the one on the UCI campus. 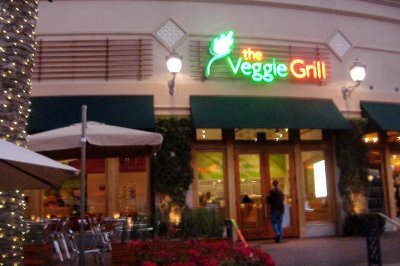 In my review of their UCI location I said, "I guess The Veggie Grill has as an unstated goal the mission to show carnivorous humans that you can make pretty good meals without meat and without a 'health food' stigma" but last night I found out from both their founders that this is their explicit, stated goal. In the words of one of them, "We want to take the punishment out of eating healthy," and I believe they have wildly succeeded. 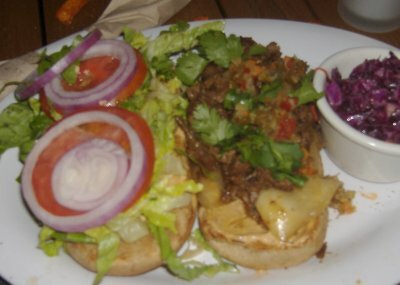 I don't know that I'll ever convert to full-fledged vegetarianism but the carne asada sandwich I had last night ("Grilled veggie-steak, marinated in Mexican spices, with southwestern spiced vegan mayo, red onion, lettuce, tomato on a wheat roll.") was so good and authentic tasting that I felt like a straight-up carnivore, but without having to deal with fat and grease. 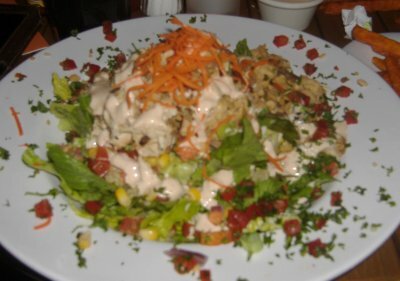 I was met there by Judy the Foodie, who thoroughly enjoyed her Chop-Chop Chef Salad, "Chopped romaine, tempeh, veggie-steak, chillin' chickin, green onion, roasted corn salsa with a chipotle ranch dressing:"
It's healthy, it tastes good, and is reasonably priced with the most expensive item on their menu being only $9.50. I'll be back, especially since I was told they were planning on adding more Mexican items to the menu. 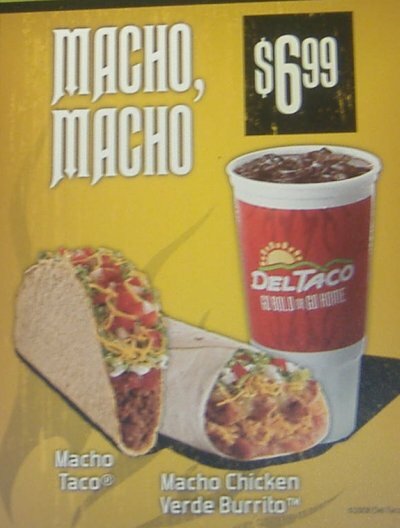 (Lake Forest, CA) Nov. 17, 2008 — Del Taco's newest promotion makes going out to eat an easy option for budget-sensitive individuals and families. The promotion, which begins Nov. 19 and runs through Jan. 6, features a new $2.99 Classic Combo Deal and a new $8.99 Fiesta Pack. The Classic Combo Deal includes a Classic Taco with double the meat and freshly grated cheese and tomatoes; a Del Combo Burrito packed with slow-cooked beans, seasoned taco meat and Del Taco’s signature red sauce; and a choice of drink. The Fiesta Pack, which is a first for Del Taco, easily feeds a family of four or more, and combines six half-pound Bean & Cheese Burritos and six tacos. Boxed to go, the Fiesta Pack is ideal for tailgating, taking to the soccer field, or to take to a party. "We know people are watching their budgets, and going out to eat is a choice," said Sharon Fogg, Del Taco senior vice president of marketing. "With our Classic Combo Deal and Fiesta Pack, our fans have an ideal lunch and dinner option that allows them to enjoy the Del Taco experience while watching their budget." Del Taco TV and radio spots, developed by Doner Advertising, will promote the Classic Combo Deal from Nov. 19 to Dec. 20. In the TV spot, a peculiar assortment of strong characters encourages a young customer to boldly opt for the Classic Combo Deal. The Taco Trio with a Classic Taco, a Taco Del Carbon, a Big Fat Taco and a regular drink for $4.99. 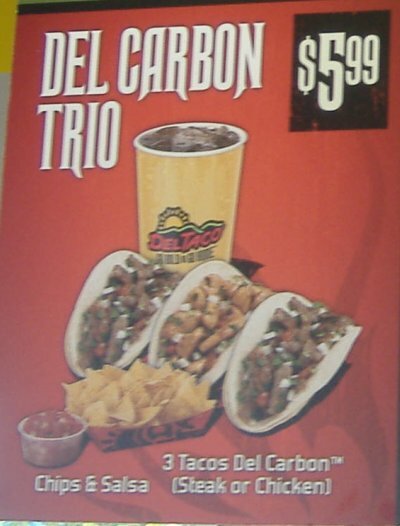 The Del Carbon Trio with three Tacos Del Carbon, chips and salsa, and a regular drink for $5.99. 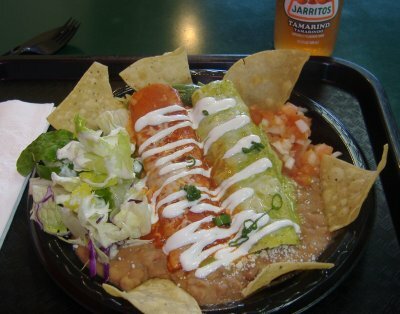 The Macho, Macho Combo with a Macho Taco, a Macho Chicken Verde Burrito and a large drink for $6.99. 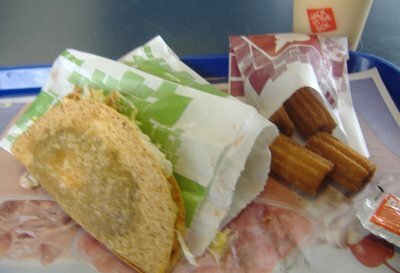 More information on the Del Taco deals, including a YouTube commercial, can be found at the Fast Food Maven blog. 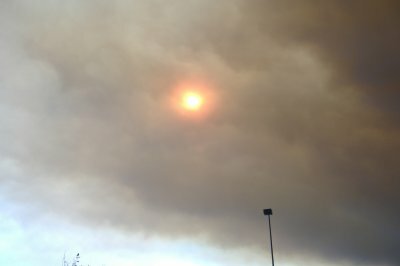 Here's a place I reported on before. 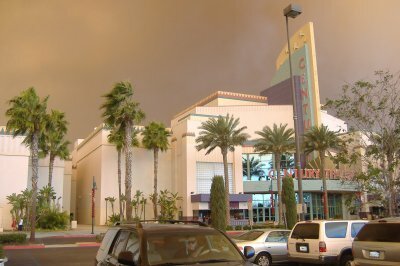 I went to this restaurant first in November 2006 with Chris and Kristanna, then, a year later, I went by myself when the wildfires were raging to obtain photographic evidence that it had not been damaged by the fire. 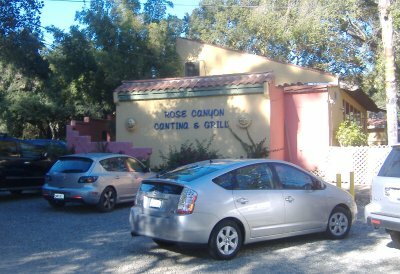 Then I thought maybe I could go to the Rose Canyon Cantina as an annual thing every November. 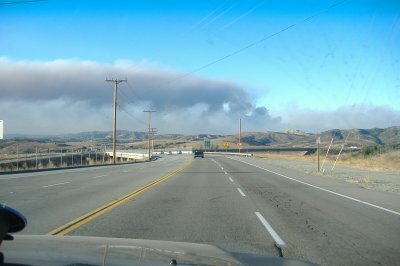 When I set out to go there earlier today I didn't know there'd be another fire going on. 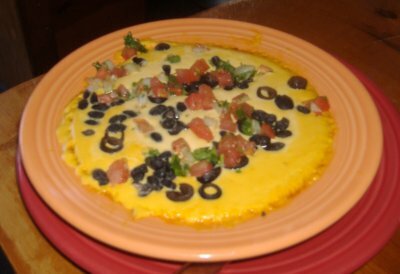 We started out by sharing the Queso Fundido, "A spicy Mexican cheese fondue blended with mild green chiles and served with your choice of corn or flour tortillas:"
I, too, broke from form by ordering a non-Mexican entree, the "Beardslee Burger." 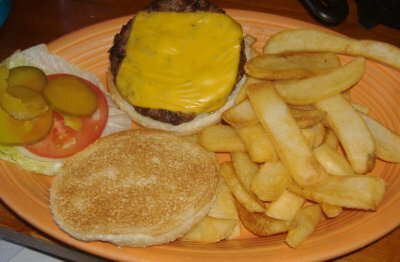 This is a burger that Wendell Beardslee created when, in 1956, he opened the restaurant that later became Rose Canyon Cantina and Grill so it has some history to it. 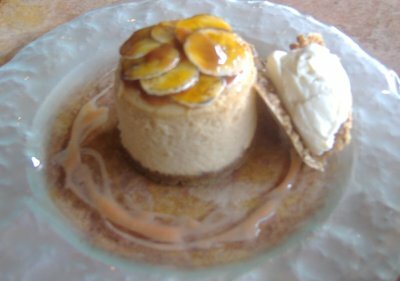 While my dining partner loved the Dulce de Leche Cheesecake, "Caramelized bananas, guava coulis & tropical sorbet:"
NEW YORK – NY The fresh and bold flavors of Tacos & Co. may be coming to a neighborhood near you! Tacos & Co., Orange County's wildly popular Mexican restaurants renowned for their authentic cuisine, has just announced that they have become a franchise company. Although the current focus is to offer franchise opportunities in Southern California, trends point to the restaurant's increased popularity - and with that, opportunities for locations throughout the state, West Coast, nationally and eventually internationally. Tacos & Co. Founder/Owner Francisco Hernandez turned to franchise industry giant Francorp - whose successes include Nathan's Famous Hot Dogs, Pizzeria Uno, Johnny Rocket's, Le Croissant Shops, Bread Basket and Popeye's Fried Chicken - to initiate this new phase for the company. Since the opening of his first restaurant in 1991, Tacos & Co. has gained a following in the Orange County area, leading to its expansion to five locations (and counting). 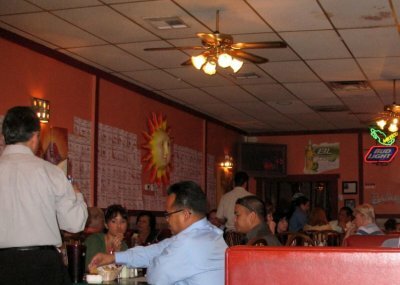 However, besides building a successful company, the journey from immigrant to restaurateur is what many find to be most impressive about Hernandez. 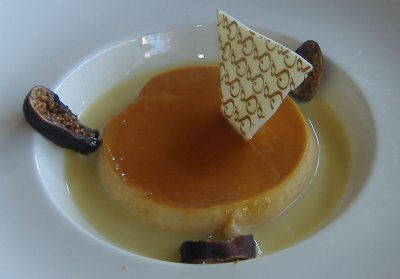 After laboring in such jobs as picking grapes and washing dishes, he moved permanently to Los Angeles at the age of sixteen, became a United States citizen in 1986, attended California State University at Long Beach, and continued in the restaurant business. In creating Tacos & Co. and its menu, Hernandez drew inspiration from home-style favorites and the street-food stands of his youth, resulting in traditional Mexican standards and combinations tailored for Southern California tastes. Known for his dedication to authenticity and fresh, homemade food, ingredients are not shipped from a warehouse – they are bought fresh and prepared daily at each location. As a way of giving back, Tacos & Co. offers a phenomenal 50% off all food to students who attend area colleges (Tuesdays and Thursdays with valid student ID) and high schools (Fridays, accompanied by an adult). In addition, Francisco has created Tacos & Co.'s own ingenious fundraising program, which allows students and charitable organizations to create and promote their own fundraising events at Tacos & Co., with a portion of all sales going to the school or organization. Francisco even allows "volunteers" to work in the restaurant for the night to really make each event their own! "The time is right to expand our concept of Mexican dining to other areas and markets," said Hernandez of his decision to franchise. "I am excited about the prospect of seeing Tacos & Co. restaurants in neighborhoods across the country and eventually around the globe." 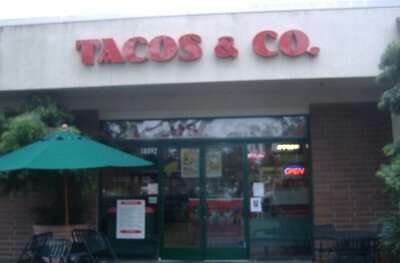 Taco & Co. restaurants are currently located in Westminster, Santa Ana, Irvine, Newport Beach and Brea, CA. CLICK HERE to read all our Tacos & Co. coverage and stay tuned for even more coverage. 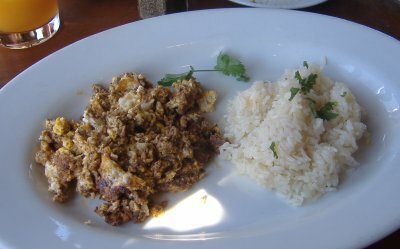 Irvine, California, October 30, 2008 – Taco Rosa at The Market Place is offering a new Champagne Buffet Brunch on Sundays, from 10 a.m. to 1:30 p.m. The elaborate buffet includes made to order omelets, fresh fruit, green salads, Mexican pastries, pancakes, enchiladas, breakfast burritos, Chile Colorado, Carnitas Casserole, Potatoes de la Casa, and much more. The brunch is $15.95 for adults, and $7.95 for children under 11. Live mariachi music completes the festive atmosphere in the casual, cantina-style setting. In addition to the new brunch, Taco Rosa has also added new items to its regular lunch and dinner menu, including Shrimp Ceviche, Lobster and Filet Mignon Fajitas, New York Steak Carne Tampiquena and fresh Halibut Cozumel. Taco Rosa has also introduced a new Cantina menu featuring the owner’s favorite tequilas, available in selected tequila flights for tastings. The wine list has also been expanded, adding new arrivals from Chile and Argentina to its already high quality selection of Latino wines. In the cantina, mixed drinks are made with fresh, hand-squeezed juices, and Taco Rosa is the only known restaurant to use daily homemade sweet and sour mix for its margaritas. 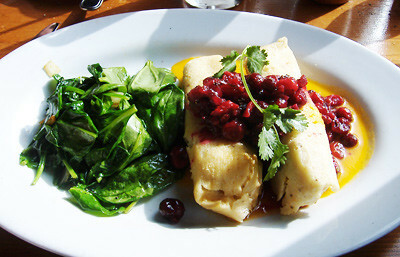 The restaurant also offers an all-Latino wine list. 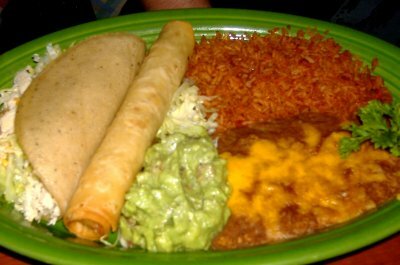 Taco Rosa is known for its authentic Mexican cuisine, featuring a variety of enchiladas, tacos, tostadas, burritos, quesadillas and tortas, along with Fiestas Mexicanas Specials, a gastronomic celebration of traditional Mexican feasts. 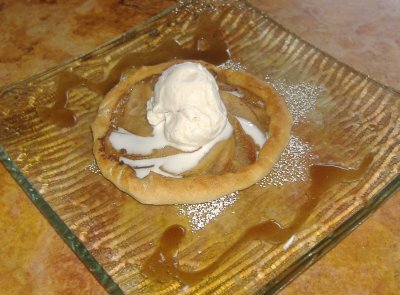 The restaurant is located at 13792 Jamboree Rd., at El Camino Real, on the Irvine side of The Market Place. For more reservations or more information, please call (714) 505-6080. 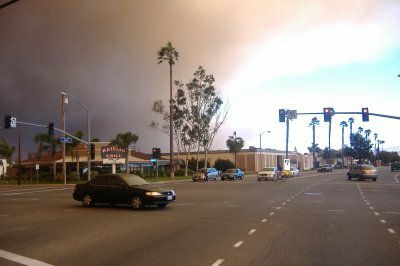 The Market Place, owned by The Irvine Company, is located off the Santa Ana (5) Freeway and Jamboree Road in Irvine and Tustin. The Market Place offers 1.6 million square feet of more than 120 shopping and dining choices. For more information, visit www.ShopTheMarketPlace.com. 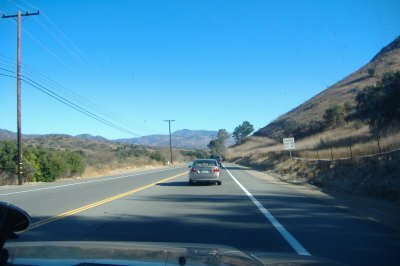 But beginning in 2008 they are also offering Thanksgiving dinner packages for pickup. Click here to read information on their Thanksgiving meal deals. Had a very quick lunch at Jack in the Box a few days ago. Got their two tacos for 99¢ deal and also tried their newish mini churros (you can buy a bag of 5 or 10). The interesting thing about these churros is that not only do they have the typical cinnamon and sugar on the outside but they also have a cinnamon-sugar glaze filling in the inside. Nice spin, Jack. Now when are you going to grant me an interview like you did to The Fast Food Maven? 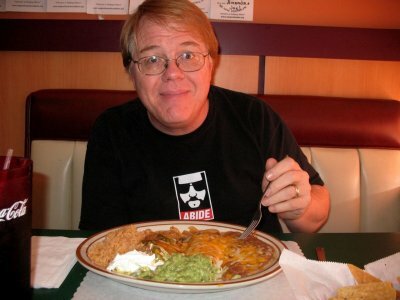 I'd have all sorts of interesting questions about the history of Mexican food at your chain.